Jennifer Bruce is wife to Jason and mom to five-year-old Emma. She blogs at where she encourages people to save money and be generous. Jennifer hosts a weekly meme called where she invites others to share simple (and often free!) ways to give. When Jennifer is not blogging, she can be found playing Candy Land with Emma, spending time with Jason, reading, or making stationery and invitations for her clients. Looking for more? Read more posts about menu planning & pantry & Recipes. Great post. I experienced similar things doing the challenge over the past month. We saved a bunch of money, ate less extravagantly, and yet still had sit down dinners as a family. If I were to do it again, I would plan better, as I definitely had moments of panic where I just couldn’t possibly figure out what to cobble together. But overall, a great lesson, for all of us. @Molly, I’m a huge fan of list-making, so I wrote out 30 meals that I could make before the month started. I don’t know if I could have done it without my list. Thank you for this post. I find myself resonating with you in many areas, especially the part about the challenge teaching you to become a better steward of what you have. Although I did not participate in the pantry challenge, I know that we have tons of food just sitting in the pantry and yet I go to the store each week and purchase additional food. This has given me the inspiration to truly use what we have and become a better steward not just of our money, but of the things and food we are given as well. My kids being older, 14, 10 and 6, AND computer savvy I was able to involve them in a fun way with meal planning. I love the Food Network. My kids will watch with me and we love the show Chopped. You know the one, they have 4 surprise ingredients in a basket and have to make something out of it. They are usually 4 items where you say….WHAAAT can you do with those?? We apply the same idea here. Pick 4 (or however many) items, google them and come up with recipie ideas!! @Kim, Hmm… Maybe my husband and I can take on this ingredient challenge! I love the advanced search option at allrecipes.com. You can type in what you have and find recipes based on that. Sometimes they pull up ideas that I never would have imagined. Great guest post! We also loved the pantry challenge and learned similar lessons. My most important lesson was, like Jennifer, learning that we don’t have to have a “fancy” meal every night. I’d love to cook like a Food Network star every night, but it’s not practical! We actually enjoyed some simpler meals & our kids were big fans of breakfast at supper. We were able to come in $100 under our normal budget without feeling a huge pinch. So we’re considering permanently lowering our budget & putting the money towards our next adoption from Ethiopia. Thank you again Crystal for the great motivation! Amy, I did not say we “cooked like a Food Network star every night”. Apparently I did not express my point very well. We took a concept they use on the show and took 4 or 5 items from our pantry, even if they did not seemingly go together and figured out what we could do with it. The ‘we’ part being most important. My children were involved in the process, too, and had a lot of fun with it! That is what my family did with the pantry challenge. Kim, your comment wasn’t posted on here when I made my comment. There is quite a delay between when you comment & when it gets posted. When I commented, there was only 1 comment posted, the first one. Sorry you thought I was commenting about you. It was just a coincidence that we both commented on the Food Network at about the same time. @Amy, My apologies to both of you for the misunderstanding. I was slow in posting comments today because the site issues were keeping me from being able to log in. It appears the issues might be fixed now (maybe! ), so I’m hopeful I’ll be able to do a better job about moderating comments in a quicker fashion. Thanks for sharing! I’ve found myself doing the same thing –using one or two ingredients from my pantry and then buying all the rest for a meal. Toning that down was the secret to reducing our grocery budget as well. We did the Pantry Challenge too and just could not believe how much food we had left at the end of it. I’m going to try for a couple more weeks just buying produce, milk and anything really important that we run out of. @TRIXIE, I’m going to try to keep our used-to-be-$70 budget down to $50-60 per week for right now. Once I can do that regularly, then we’ll be down to $50. Then hopefully $40. I just have to stay motivated to shop to restock the back of the pantry. What a wonderful post. I also experienced basically the same doing the challenge over the past month. I actually saved a lot of money. Also a family of 3. I have to agree this was a great lesson and an eye opener me as well. I get all crazy and it feels like my insides are coming out if I see “clear” space in my pantry and this has helped me get over it. I know in my mind I have plenty of food in case we are stranded in for a while. I started the pantry challenge later in January like the third full week so I was behind a little but I am going to try to continue it for the first two weeks in Feb. Thanks for the great post! I want to say thank you to you for starting this Pantry Challenge on your blog. I took up the challenge and actually found it fun! I was amazed at how the Lord helped me to be creative with what we already had and I even tried that Black Bean Soup and found it to be very good. Our cupboards, fridge, and freezer were almost empty by the end of January, except for the basic staples and I know we saved a lot of money. I think this would be a good Janurary tradition following right after two months of holidays. Jennifer thatnks for the great post. I love the last comment. My goal this year is to waste no food and if we have plenty to donate the rest. It has been a great way to cut the grocery bill again. @Heather, So true, Hather! I was sickened when I found several unopened boxes of cereal whose expirations dates were WAY past. I actually started a cereal rotation system in our basement (where the extra is stored). We open them by date now. I can’t waste that much food knowing the needs that are out there. @Jennifer, I think if my food storage was in the basemnet I would forget about it 9 out of site out of mind for me) but my loving husband gave up his office space so that I could have storage right off the kitchen. It helps to be able to look right at what I have then make a list to go to the store. We are now shopping only from the list to help keep extra spending to a minimum. That helps so much for us. I had a similar experience. I normally take out $280 cash per month to cover groceries, household items, and my entertainment month. Well, for the month of January, I used some AMEX gift cards in the amount of $250. Because of this pantry challenge, I’m ecstatic to say that as of Feb 3rd (I get paid on the 5th and will go back to cash), I still have almost $50 in giftcards left over. I ate from my pantry and freezer and this forced me (and encouraged) to take my lunch to work and not eat out. I’ve started Feb out badly, but don’t feel so bad knowing that I did so well in January. Thanks again for having this challenge. Oh my gosh! Jennifer sounds exactly like me, especially in the areas of feeling like we need fancier dinners and abandoning the menu plan for more impulsive choices. While it sounds like she was much more disciplined with her “Eat from the Pantry” challenge, I learned many of the same things she did, but hadn’t really reflected on them yet. Thanks for the thoughtful post; it gives us all something to think about! I resonated with your new-found desire to simplify meals. I love variety, but it’s true that like you, “I’ve been making things too hard–and too expensive at the same time!” Thank you for these insights! Great post! I especially like the end b/c you are right, we do need to be good stewards of what God gave us. I can totally relate in the area of not always following my meal plans. I’ve been more strict with myself these past few weeks in meal planning and grocery shopping. My grocery bill used to be $150-$170 for a family of 4- more than half the time it would look like we had no food here. Within the past two weeks I spent $112 at the grocery store and $150 at Costco (stocking up on meats and baby items). I am hoping to get that $112 down even further. I agree whole heartedly….cleaning out the pantry, fridge and freezer is an eye opening experience. @jan, Jan, if you didn’t try the Pantry Challenge, you could do one of your own this month. I highly recommend writing out an inventory of everything you have. I was amazed at what I found. It was like putting a jigsaw puzzle together. I tried to piece together everything I had without having to add much to it. I was so pleasantly surprised at how little I had to buy. Then I was able to focus on the rock-bottom priced sale items. (We’ll be eating a lot of flavored rices this month!) Go for it!! Love this post! Our family could not do the challenge for all of Jan so we are trying it in Feb on our own. Reading your post was like having a mirror reflecting our family. We’ve been blessed with 5 kids and I justified our spending on our family size – WRONG – I was not using the resources God has given us very well and I completely identified with the waste you were talking about. This month I am sticking to the plan instead of eating out and fixing smaller meals. Thank you for sharing. I’m glad you were able to get your budget down so far. Planning can save sooo much money! In some parts of the country it is impossible to go that low. I, like you, have often felt like it would be impossible to go as low as Crystal does. I’ve given up trying, so that my kids don’t starve, and am very happy to be at $100 a week for our family of 5. We still spend 50% of what most families our size in our expensive state spend. My kids also eat a TON! They are 1,3, and 5 and ate an entire package of beef hot dogs for lunch today and didn’t even save any for their dad! They can polish off a whole homemade pizza for supper too. The teen years are going to be interesting at our house! @Lindsey Swinborne, Lindsey – I often see frugal bloggers posting about farmers’ markets and bulk food stores that they frequent, and I realize that that’s another way that they keep their food budgets so low. We don’t really have those things around here, but I’m trying to make the best of our Kroger. Sounds like your crew is eating well on a budget! i have a question. i am really wanting to learn how to cut back our grocery spending and am in awe of all the tips i am seeing from you, as well as other blogging mamas. my question is, we do alot of our shopping at costco. do you buy in bulk? alot of what we buy lasts much longer than a week so we have more of a monthly grocery spending budget. i don’t have, or haven’t made, the time to sit down and add up what is food items and what is household (toilet paper, etc) to see what we spend on food. when you talk about weekly grocery bills, is that food only? @amancia, Great questions, Amancia! When I say “grocery budget,” I actually mean food, personal care items, paper goods, cleaning supplies, etc. I used to be a Sam’s Club shopper, but now I’m finding that buying in smaller quantities is much cheaper. A large box of Wheat Thins might be $7 at Sam’s Club. But this week I can get the regular-sized boxes for $.99 after coupon at Kroger. I can use multiple coupons, buy multiple smaller sizes, and end up paying much less for the same amount I would get in one package at Sam’s Club. I’ll buy as many as I can so that they’ll last until this type of sale comes around again. I’ve heard people say that stores like Sam’s and Costco are good for meat and dairy purchases. I’ve not shopped there for quite a while, so I’m not able to address that accurately. It might be worth a little bit of time to make a list of the prices that you usually pay at Costco and then see what you’re able to get those same items for (with coupons) at a grocery or discount store. @amancia, I thought to put in my two cents. We used to do our shopping at sams and the I discovered coupons. I take the time to write a list of what is on sale at the regular stores and how much they cost with coupon savings. When we hit the sams I take that list with me. If it is cheaper at sams and I need ( notice I said need not want) the item we buy it there. Most times things are not cheaper when you have a sale and coupons. Also be careful of the per oz pricing they have. It will lead you to thinking you are getting a good sale when it actually costs more. We find this mostly with the laundry soap and things down those isles. Hope this helps. It takes time to figure out your family grove. Our family did the Pantry Challenge in January and not only did we save money, I had an “ah ha” moment when I realized I probably had a two or three month supply of food in my pantry and freezer. 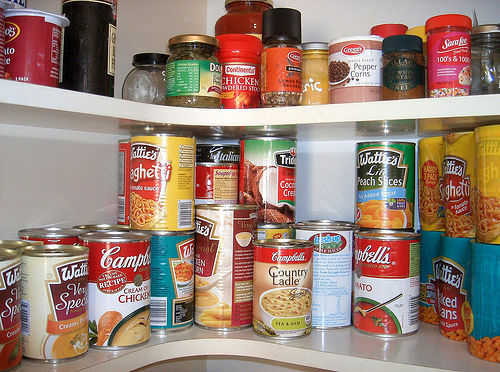 As I dug through the cans and boxes of food I had purchased inexpensively with coupons in the months before the challenge, I realized that if the food just sat in my pantry unused, it wasn’t cheap. So I did learn a valuable lesson about the importance of using the food I had spent time and money purchasing. Thank you !! That was a fun post to read. I was thinking today about the things I have learned what we were able to accomplish through the pantry challange and I enjoyed reading someone elses thoughts on it as well. I loved this post and all the comments! Our family is still “eating from the pantry” and it is incredible what is left in my cabinets and freezer! I was able to only spend $75 in January so I donated the rest of our grocery money to Haiti relief. I plan to continue as long as I can and save the grocery money for our meals out on vacation. I am still coming up with new ideas for the food I have available… last night we ate beef fajitas from some left over roast beef I had. In the past I would only have made them with fresh chicken. I, too, took a complete inventory for the first time and was shocked at all the ingredients I had available to work with. Another new avenue I have taken is to think of ways to save on my ingredients by not letting things go bad. Usually I buy bigger quantities ( I shop at Aldi) because it is cheaper even if I have to throw away some. Example: lemon juice. This time when I bought the large bottle, I froze small portions in an ice cube tray, popped them out and bagged them. I am planning to do the same with our orange juice, milk, buttermilk and even vegetables when they are on sale. I can’t wait to see how much we save using these methods! I have been toying with the idea of doing this ever since you started talking about it, but I’m too much of a chicken. Our grocery budget for a family of three (soon to be four) is only $165 a month, including diapers, so the money is not the issue. I LOVE shopping deals and seeing what I can come up with. I feel like it will be so hard to not head out there every week. My good friend and I often meet at the grocery store with out kiddos. 🙂 I know it sounds silly, but this could be my biggest challenge. Expecting baby #2 has inspired me to look a little further into doing some pantry clean out and seeing what we need for those weeks and months ahead when I don’t have time to go shopping. Someone mentioned in the comments about writing everything down that you have, this might be a HUGE eye-opener for us. Thanks so much for the great guest posts, Crystal! I love reading your blog, but also great that you are sharing other’s perspectives. @Melody, I think that the pantry inventory was the biggest eye-opener of all. I would encourage you to do your freezer while you’re at it. I found some things there that were WAY past their useful life! I also found lots of veggies for soup, so I know that I need to plan some soups in the upcoming weeks. Thank you so much for this post, I could have written it!! (not quite so eloquently though!) this is my problem. I always chalked it up to the fact that I work full time and have a lot more on my plate, well I am going to try to stop making excuses, stick to the plan, and save money!!! @Kathryn, I’ll be honest with you… I work 3 days a week, and the nights when I had worked all day were the ones where I was most tempted to not stick with the plan. Instead, I planned around the nights I knew I’d be most tired. I did either a Crock Pot meal or planned leftovers. That was a HUGE help! I feel like I set myself up for success rather than allowing myself to sabotage my own plan. Thanks so much for sharing what you learned! I learned many of these things from my month of eating from the pantry, too. I was amazed a how much I didn’t need to impress my husband with something fancy. In fact, a couple of times when I had planned to make dinner, he would come home overly full from a business lunch and just want a salad. We can live on a lot less than I though we could! I shop Sam’s Club. Right now, everyone is blogging about the great Kroger cheese sale, where they are getting cheese at $1.50 for an 8 oz package, on the mega sale and with coupons. I can buy cheese at Sam’s Club for $2 and under a POUND, every day, with no sales or coupons. That’s 40% less! So, Sam’s Club works for me. It’s been fun reading YOUR guest post! @The Prudent Homemaker, Great information about Sam’s! I’m thinking that doing some investigating using the coupon policies in your area and the Sam’s prices in your area is your best bet. Maybe shop at Sam’s for the things that are priced best there and your grocery store for things you have coupons for, especially if they double like ours do. Great posts! You do know how to manage your finances. Thanks, I’ll stop by another time. 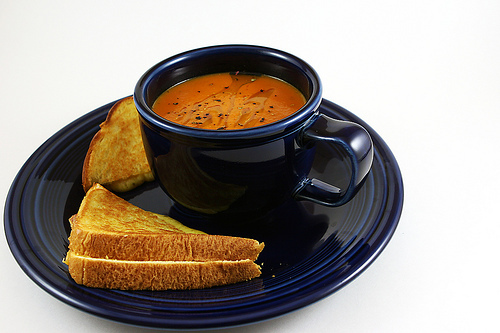 My husband loves grilled cheese and tomato soup also. I was really surprised when he told me this is one of his favorite meals. Mine are not elaborate – trying to feed four young children and two adults, I don’t put a lot on the table that could have heads and noses turning. I’ve been really surprised that my kid friendly meals are just fine with my husband. And I try to make something special for just him every once in a while – kids get sandwiches and he get salmon. It works out nicely for everyone. Thanks to the challenge to eat from the pantry we lowered our grocery bill this month from $300 to $50!!! With that savings we donated to Samaritan’s Purse Haiti relief and Wycliff Bible Translators!! Woo hoo!!! @CC, I guess the name of my blog (Saving and Giving) gives away my passion for giving, but I LOVE, LOVE, LOVE the idea of using grocery savings to help others! Yay!!! All i can is….. I absolutely LOVE this post!!!! I really like this post. We “sort of” did the pantry challenge in January, but I still bought groceries and didn’t save that much. However, I live in central Maryland and I think I’m going to have a LOT of opportunity to stay inside this weekend and do some cooking – 1 to 2 feet of snow is coming our way! We bought milk and fresh fruit and veggies at Aldi’s on Monday night and if the snow hasn’t started by the morning, I will probably pick up another gallon of milk, but the stores around here are INSANE when snow is predicted, so I didn’t even try to get it last night or tonight. I’ll actually go to 7-11 for the milk; it might be more expensive, but I’ll be able to get in and out of the parking lot. If you don’t live in this area or a similar urban area, you just have no idea! I have several recipes I want to try and have made some room in the freezer, so I’ll be making and freezing cookie dough and some small casseroles for our family of two. My daughter thinks I’m insane, but I am so looking forward to this – not the shoveling, but the cooking! @Mar, So true Mar! I live in Maryland too and people were crazy at the store last night. Entire shelves of eggs, bread, and other items were wiped out completely. Originally being from Minnesota, I just don’t get it! I wouldn’t have even been there except that I’m cooking for a reception this weekend and needed just two more things. Now if the snow doesn’t get bad enough to cancel the reception! @Mar, I live in Northern VA and heard about the craziness at the stores. However, I had already started on the pantry challenge so had no need to go out in the melee! I know it is hard for Northerners to understand the panic, but you’ve got to remember that up there when you have foot upon foot of snow, the roads are still cleared! Here they become impassable because the plows can’t keep up. The pantry challenge is a great way to stay calm and even excited about being snowed in, instead of panicking! I totally agree w/ you (and the others!) – I have been stuck in the $70 rut for about 6 months now and I am trying to get down to Crystal’s $40 too! Thanks so much for sharing your experience! @jamie, I’m hoping that my baby steps down to $40 will dot he trick. I’ve decided that trying to get there all at once just isn’t working for us. But allowing myself a limit of $60 and then trying to stay under that is working. Next I’ll be dropping my limit to $50 and trying to stay under that. I just started couponing before Christmas so didn’t have a stockpile to do the challenge in January but am definitely looking forward to doing it in a few months. I have found a great website (www.supercook.com) that is already helping me cook with what I have on hand. You enter the items you have on hand and it searches lots of recipe websites to give you options! We already tried a simple dish called megadarra that only needed lentils, onions, rice, and some spices and made about 10 servings so I have some frozen for a lazy day! @Jaime, I just checked out the SuperCook website. It is fabulous! I still have a few odd pantry items that I wasn’t sure what to do with. This will help me get creative with those. Thank you!